Take a virtual tour of my bookshelves! This is SO fun! My friend, Anne, from is hosting a virtual tour of bookshelves this year. She asked if I’d share and I had a blast taking pictures and talking about our “system” for organizing books. Head on over to to see pictures and details on the bookshelves we have at our house. 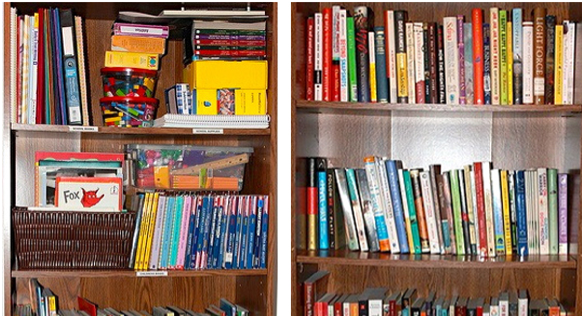 And just for fun: How many bookshelves do you have at YOUR house? Too many bookshelves! Ahhh.. such is the life of a homeschool mama! What a fun idea! May have to jump in! We are up to 3 regular size and 1 extra large bookshelf. The three regular size hold the children’s books. And I am ready to be on board with getting rid of the so-so ones as I am doing a massive de-clutter for our spring garage sale. Haven’t been able to part with many in the past, but as we keep running out of room I have been inspired by your method of only keeping the best! We’ll still have plenty because there are many titles we love!!! It was great to take a peek at your shelves! I am constantly blessed and inspired by you! God bless! My system for deciding whether to keep a book: If I would recommend it to a friend, I keep it. If not, then it finds a home elsewhere. It’s amazing how much more I enjoy my collection now. I looked at your January list, and I have to say, it looks interesting. I watched the movie based on Sarah’s Key, and I have to tell you, that I after I saw it, I had to stay up and prayed that the Lord would help me remove it from my memory. It was a great movie, for the most part. I will have to add a couple of you books to my list for the year. Will you post you other lists for the rest of the year? Would love to see what you are reading. Yes, I plan to post my lists for each month at the beginning of the new month. And then I’ll post a recap on what I read and what I thought about the titles at the end of each month. 3 large ones definitely not enough! I am still looking for a way to organize all the books for my family of 5. With books for homeschooling, Bible reading/study, interests/hobbies and free time reading, we do not have enough space. Some have been moved to the basement but with no system. Help! Not enough! We have 3 big shelves and 1 small one. We’ve also filled 2 cabinets with books! Love, love, love books! I have 2 tall bookshelves and 1 short bookshelf, although one of the tall shelves is currently dedicated to photos and scrapbook albums. I have to make a conscious effort to keep my books under control; reading ebooks and checking books out from the library is very helpful both in keeping clutter down and with my budget! we have six book shelves, but two hold our dvd/movie collection. there are four in our office for my paperback collection, cookbooks, textbooks, etc. We are a family of only three booknerds,but we have 6 bookshelves at home, and I have one in my office, we have a stack or two of books that need a home. Last year during the clutter-busting challenge I purged a fair amount of books, but I need to do it again–some of the books I see on the shelves, I question why I didn’t get rid of them already. Books are my worst item that I probably come close to being a hoarder. Well, I am not a pack rat or hoarder with any objects except books! I’m trying to weed out some of them and only keep the best, but for now – between our bedroom, living room, hallway, and my two daughters’ bedrooms – we have 7 bookshelves (all with three to five shelves apiece) in our house. We have enough books to fill at least one more…. M 4 children all have a bookshelf of their own and my husband and I “share” three more. I say share but he has 2 shelves. We love books. Then every week we check out books at the library. Each bedroom has overflowing bookshelves there are bookshelves in the living and dining rooms (6 rows high, 2 books deep in places). We are all book packrats trying to learn to let go. Daughter 1 collects Nancy Drew, Daughter 2 collects Magic Tree House. Husband – Tom Clancy, Clive Cussler. 4 bookshelves and a very, very large stack of books that need a bookshelf. We also have a couple baskets beside our bed with books. We have 6 bookshelves a a few shelves or cubbies where books end up! 3 big ones, a big cabinet for homeschool books, and a small bookshelf in each of the children’s rooms. I have no idea how many boxes full in the attic. My husband and I have always loved books, and have both collected high quality books since we were kids. We go on thrift store dates and almost always come home with several more. A couple years ago the hugest thrift store in town, which has a book section that alone is nearly as big as an entire store, was GIVING AWAY any and all books. There was a limit of one buggy load per family. A whole shopping cart piled with books!!! And I admit, I went back each of the next two days also. Okay, sorry, I’m still excited just thinking about that. Score of the century for this book loving family! I love that we have a huge attic because we can take advantage of stuff like that and not have to worry about it junking up the house. And most of them I can’t bear to part with because they’re older books that you can’t find just anywhere. Anyway, loved seeing your (very organized) setup! Total bookshelves – 5. They’re here and there around the place, not a singular bookcase. They’ve been expanding this year. Although I enjoy living simply, it’s nice to hang on to some favorite reads that are special. We used to have only a few shelves scattered around the house. 2 years ago we added on and ended up with an extra room perfect for a library. My father in law built floor to ceiling bookshelves around half the room. Love it. Boys also have a small bookshelf in their room. Girls keep boxes of books next to each of their beds. Needless to say we love to read.